The Rifflin Hitch Lodge is a beautiful place if you are looking for accommodations while visiting Southern Labrador in Newfoundland Labrador in Canada. The interior hallways are constructed with lightly colored wood and spectacular creations of Eskimo art that blend in with the wood coloring. Artwork on the walls in the accommodation wing of Rifflin'Hitch Lodge, Southern Labrador, Labrador, Canada. 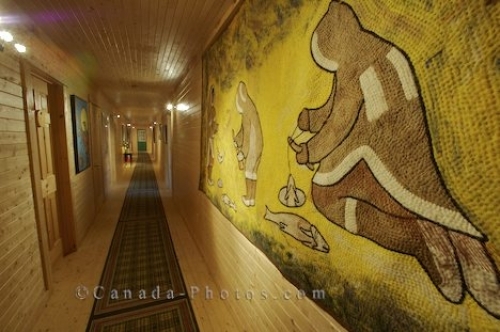 Picture of Eskimo art that decorates the walls of the Rifflin'Hitch Lodge in Newfoundland Labrador in Canada.